-Patients with tracheostomy and laryngectomy – what you need to know. 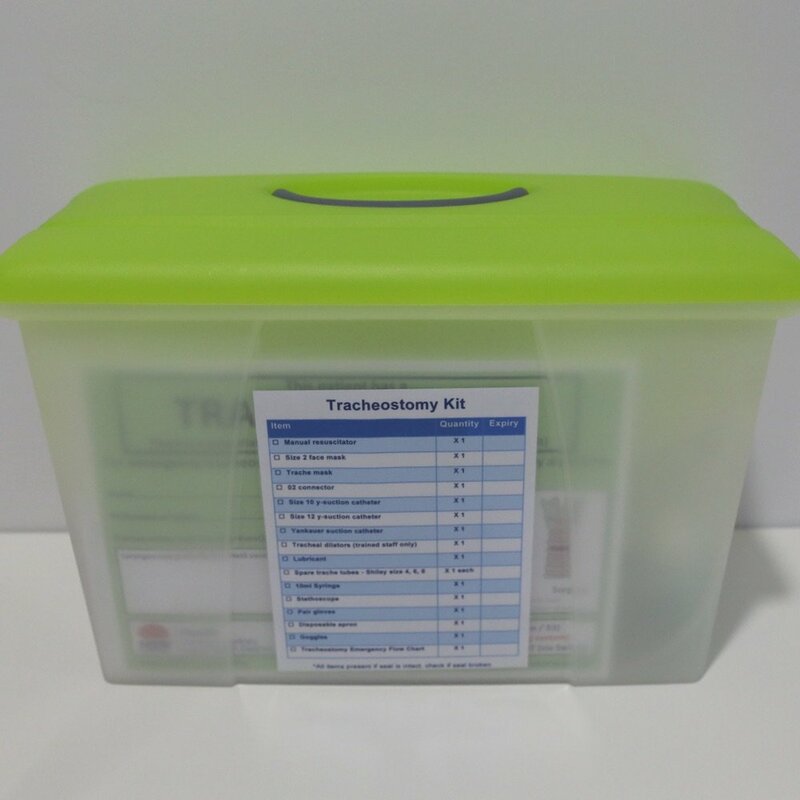 You will encounter many different tracheostomy tubes in hospitalised patients, but also in patients in the community and presenting to the Emergency Department. It is important to know the types of tracheostomy tube that are in common use. They are available with and without a cuff, with or without a fenestration to facilitate speech, and with or without an inner cannula to help with the clearance of secretions. Cuffed tubes are required when positive pressure ventilation is being used, and provide a barrier against the aspiration of secretions, although even a correctly inflated cuff cannot provide absolute protection. Fenestrated tubes allow for gas to pass upwards through the vocal cords to facilitate speech. However, this fenestration will also allow the downward passage of secretions. 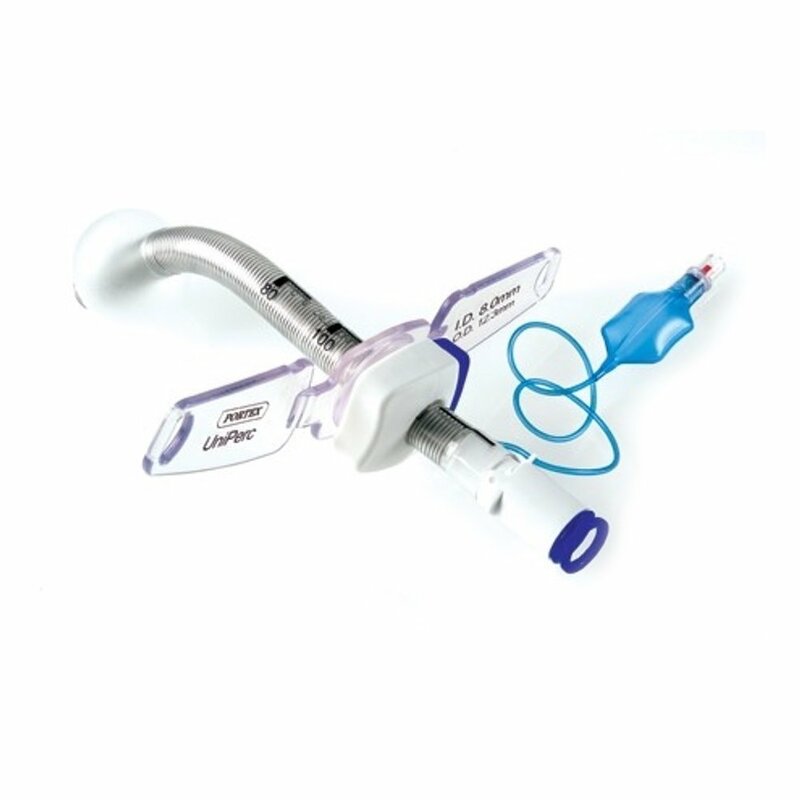 It is important to know that some tracheostomy tubes (for example, Shiley™ tubes) need the inner cannula to be in-situ for a breathing circuit to be attached, whereas others (for example, Portex™ tubes) can be attached can be attached to the circuit with or without the inner cannula in place. By convention, the inner diameter (ID) of tracheostomy tubes is given as the ID of the outer tube if the breathing circuit can be attached to the outer tube (e.g. Portex™ tubes). If an inner cannula is required for connection to the breathing circuit, the ID is given as that of the inner cannula (e.g. Shiley™ tubes). 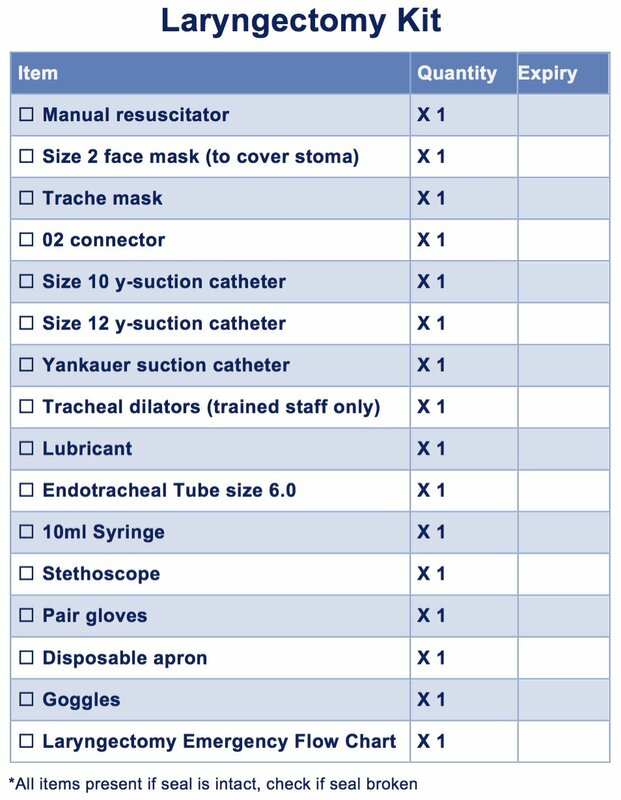 Measurements of some commonly used tracheostomy tubes are given in the table below. It can be seen that the nomenclature differs between different brands, for example, Portex™ tubes have ‘sizes’ equal to the ID of the tube without its inner cannula, while the given ‘size’ of Shiley™ tubes does not equate to any measurement, but closely approximates to the ID of the inner cannula (which must be in place for a breathing circuit to be attached). 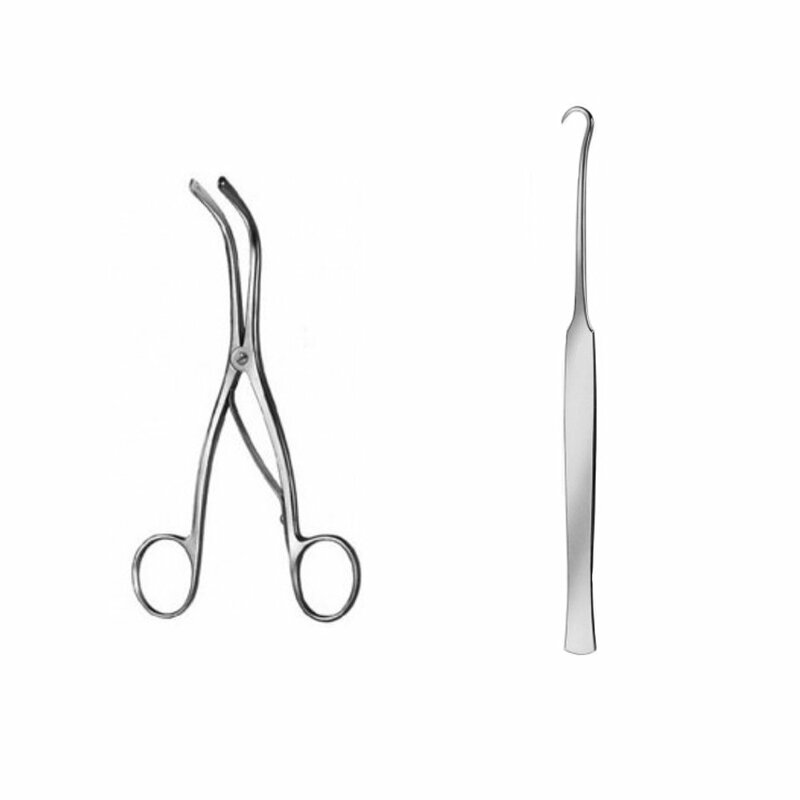 It can also be seen that different brands have different ratios of ID to OD, with the Portex™ Uniperc™ having the most favourable ratio, due to its thinner-walled, metal-reinforced tubing. 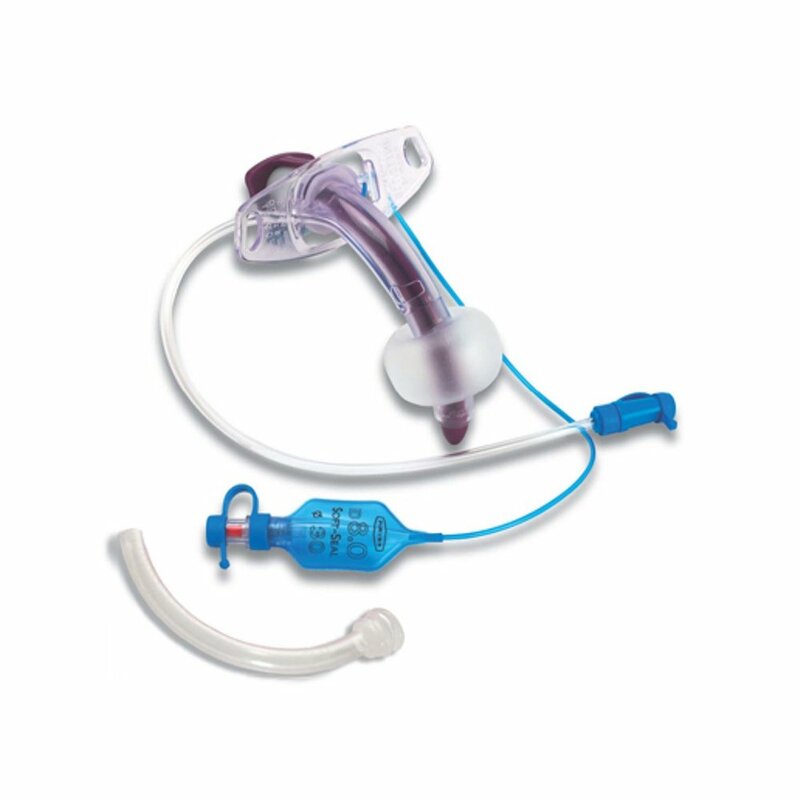 The Uniperc™ is an example of an adjustable flange tracheostomy tube. These devices consist of a tube which passes through a flange with a locking device, allowing the length of the tube inside the trachea to be adjusted. As can be seen from the table, the potential length of these tubes is significantly greater than the fixed length tubes. They are therefore useful in patients with a large amount of tissue overlying the trachea, such as obese patients. As obesity becomes more prevalent, it is important to ensure that a long enough tube is selected. 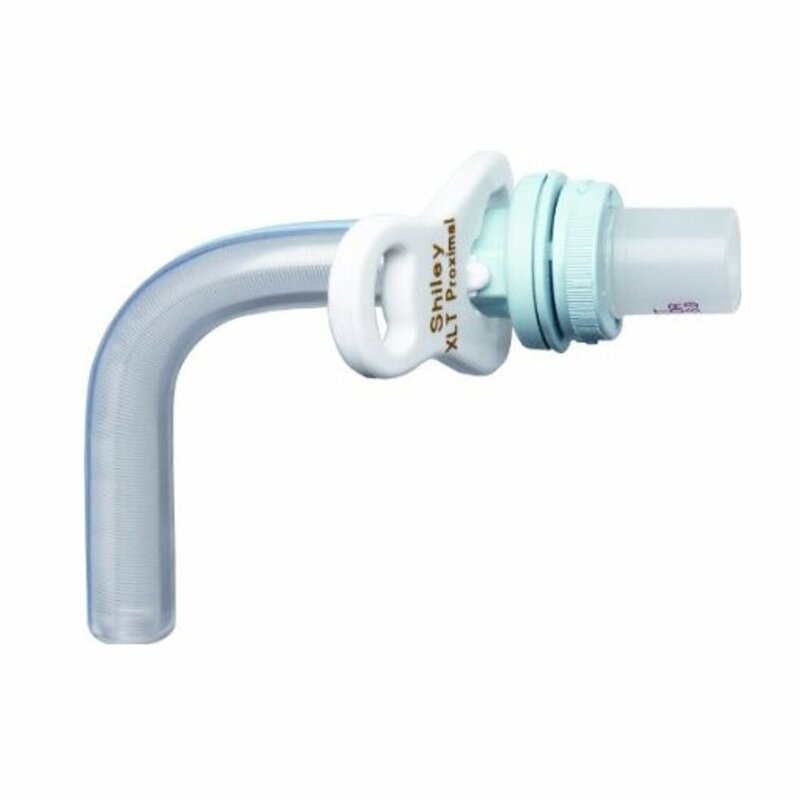 An adjustable flange tracheostomy tube is one option, but an extended proximal length tube, such as the Shiley™ XLT™ Proximal, may also be appropriate. 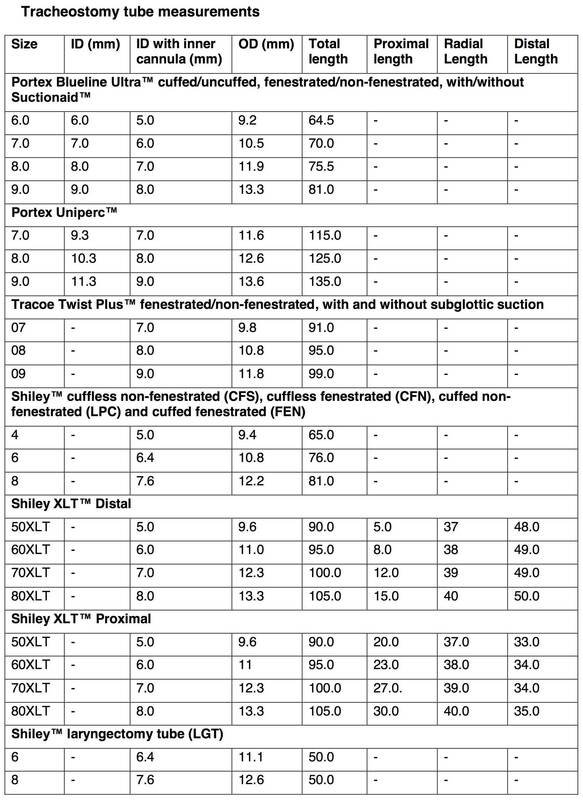 Data from one study suggest that standard tubes, such as Portex™ Blueline Ultra™ and standard length Shiley™ tubes, are too short in general.5 In this study, measurements were taken of the distance from the skin to the trachea (stomal length), the angle of stoma formed (stomal angle) and the distance from the tip of the tracheostomy tube to the carina. Data from 50 non-morbidly obese patients (body mass index of less than 35) showed an average stomal length of 26mm, stomal angle of 113 degrees and tube to carina distance of 43mm. A size 8.0 Portex™ Blueline Ultra™ tube has a stomal length of only 9mm, is set at an angle of 90 degrees and is 75mm in length. A standard Shiley™ tube has a continuous curve (so has no fixed stomal length), an overall angle of 135 degrees and is 81mm in length. 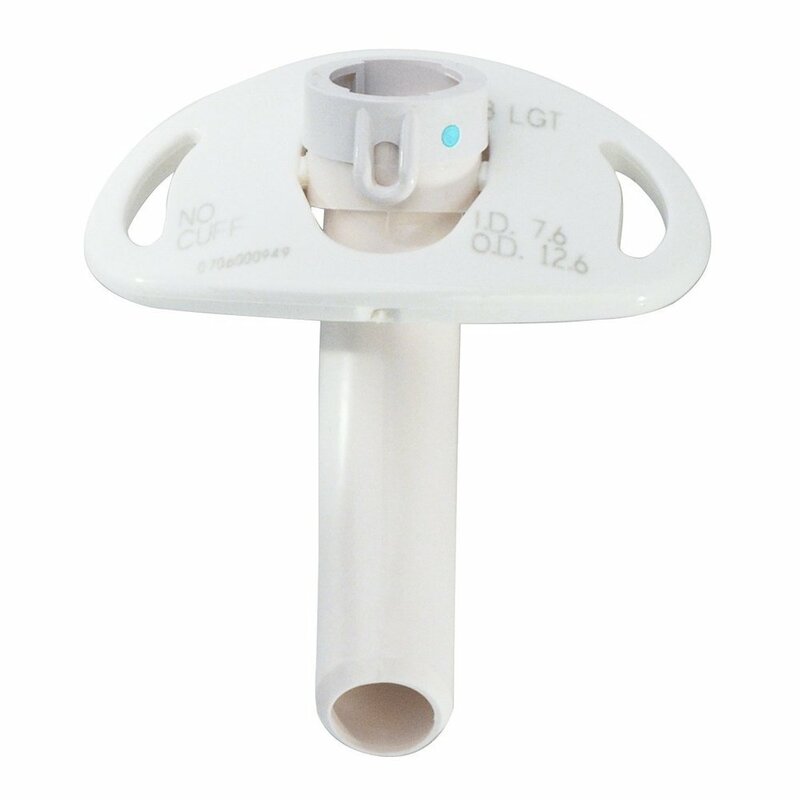 The authors recommend that tracheostomy tubes of this nature (without an adjustable flange) should be redesigned, with 10mm added to both the stomal and intra-tracheal lengths (an increase in overall length of 20mm) and their stomal angle changed to 110-120 degrees. Great care must therefore be taken with the choice of tracheostomy tube. 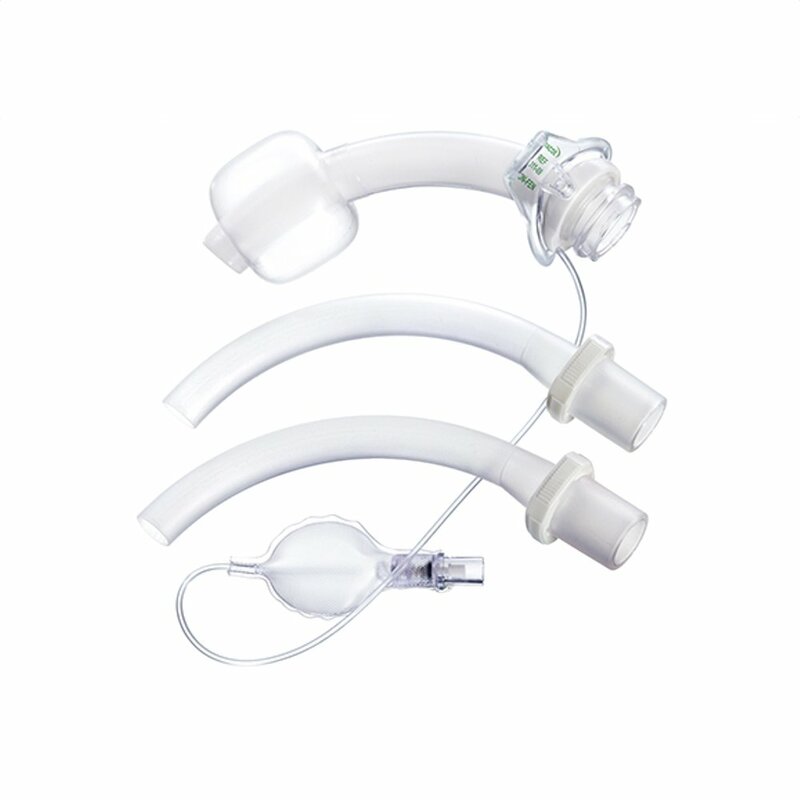 If in doubt, an adjustable flange device offers the opportunity to alter intra-tracheal length after placement. Depending on where you work, you may be asked to help change a tracheostomy tube. There are a variety of reasons why this is done: to reduce the size of the tube during weaning or due to incorrect size; tube or flange fracture; cuff failure; routine changes and rarely, to increase the size of tube to allow for the passage of a bronchoscope.6 Routine changes are performed every 60-90 days, because tubes perish over time, increasing the risks of device failure and chronic infection. At least two skilled clinicians should be present during a tracheostomy tube change and at least one should have advanced airway skills. Full resuscitation equipment must be readily available, including equipment and drugs to perform emergency oral intubation if required. 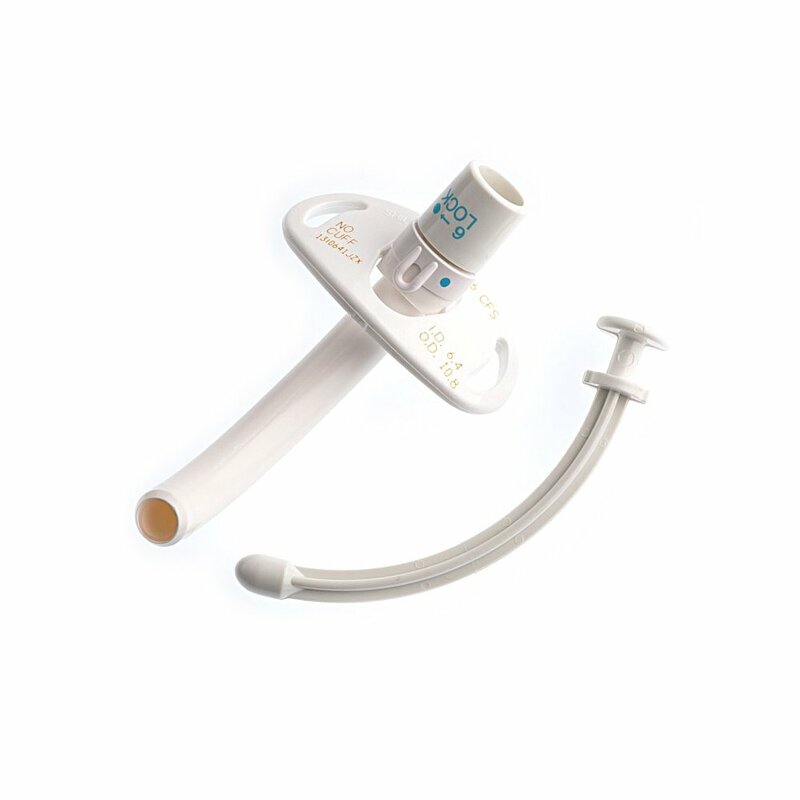 A range of tracheostomy tubes of different sizes should be available, and the tube should be well lubricated prior to insertion. It is advisable to use an introducer of some sort to guide the tube into position. This may be provided with the tube (in the form of a guide-wire or obturator) or improvised: a cut-off suction catheter or nasogastric tube will suffice. The intruducer should be inserted into the old tube and down into the trachea, the tube removed over the introducer, then the new tube inserted over the introducer. In the case of a very well established stoma, an introducer may not be necessary. In all cases, a good hint is to insert tracheostomy tubes with their long axis perpendicular to the long axis of the trachea initially, then rotate into alignment as the tube is passed downwards. In Australia, the Clinical Excellence Commission (CEC) has also identified the care of patients with tracheostomies as a problem area, resulting in the issue of a New South Wales Health Safety Notice.10 The CEC analysed data from their Information Management System (IIMS) and identified eighteen deaths between 2007 and 2012. They found that clinician skills and knowledge were deficient in 82% of these cases, and a lack of the correct equipment in 64%.11 This led to the creation of a new Agency for Clinical Innovation (ACI) Practice Guideline covering all aspects of tracheostomy care.3 Key recommendations are that a model of care be created in hospitals, including the establishment of emergency procedures to be available in all clinical areas, comprehensive education and the location of patients with tracheostomies in wards with appropriately trained staff. The guideline lists the equipment that should be available at the bedside of patients with a tracheostomy, to include a humidification system. 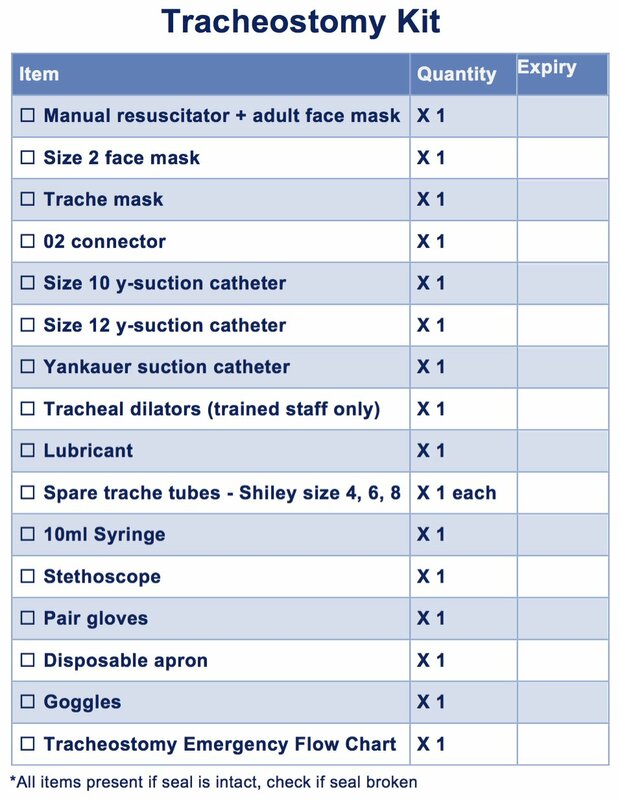 A list of the equipment that should accompany hospitalised patients with a tracheostomy is shown below. -A Water’s circuit (floppy green bag) is recommended (instead of a self-inflating bag) for two reasons: it can be used to assess for air entry (the green bag will inflate and deflate, whereas a self-inflating bag will not); and it can be used to provide gentle ventilation with more tactile feedback, to avoid causing surgical emphysema in cases where the tracheostomy tube has become displaced into the soft tissues of the neck. 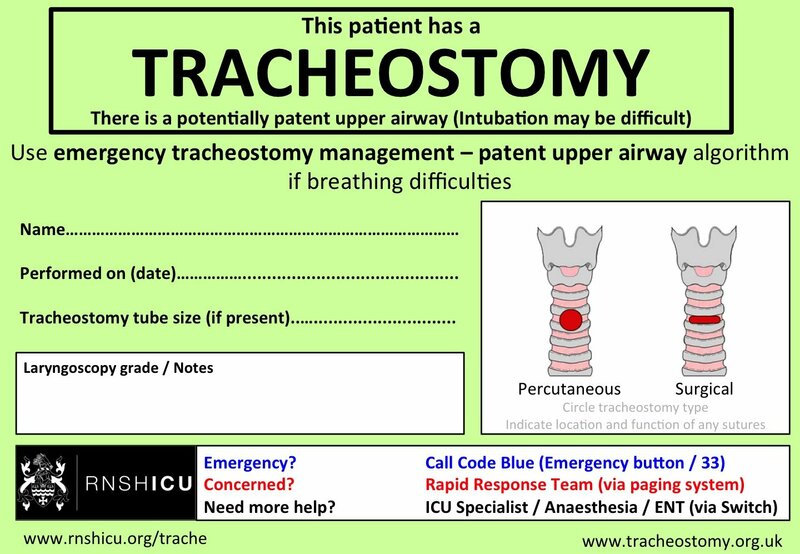 -Purple box: there are three simple manoeuvres to assess tracheostomy tube patency. If these are unsuccessful, the tube should be removed. -Standard oral airway management is then the priority, with instrumentation of the stoma being the last resort. -A Water’s circuit (floppy green bag) is recommended (instead of a self-inflating bag) for two reasons: it can be used to assess for air entry (the green bag will inflate and deflate, whereas a self-inflating bag will not); and it can be used to provide gentle ventilation with more tactile feedback, to avoid causing surgical emphysema in cases where the laryngectomy tube has become displaced into the soft tissues of the neck. 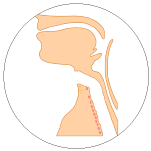 -Purple box: there are three simple manoeuvres to assess laryngectomy tube patency. If these are unsuccessful, the tube should be removed. 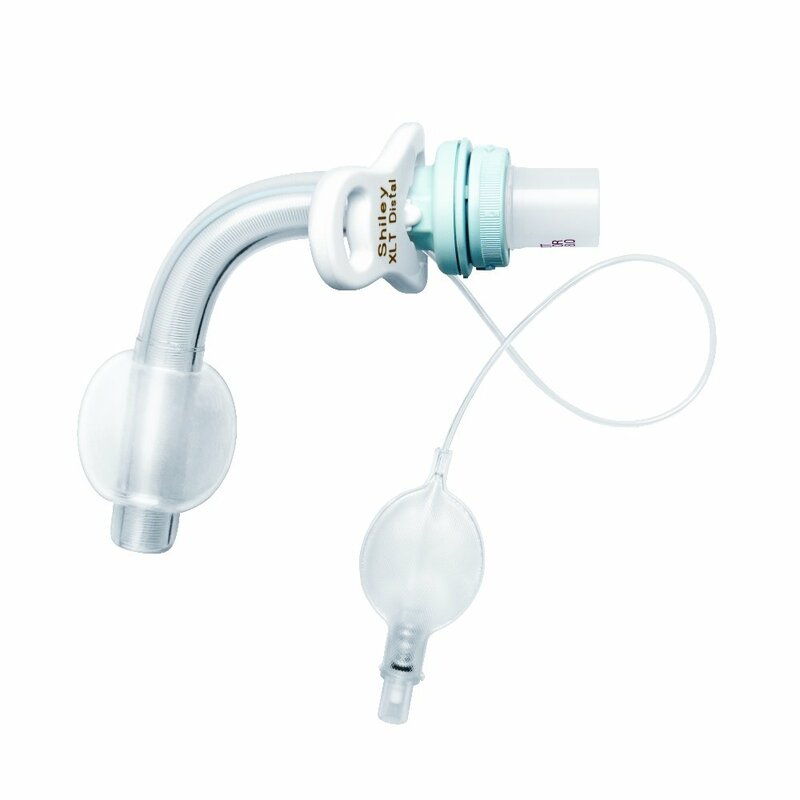 -Laryngectomy stoma ventilation by mask is then the priority, with instrumentation of the stoma being the last resort. A bougie, exchange catheter, or bronchoscope may help to identify the trachea and replace the laryngectomy tube. 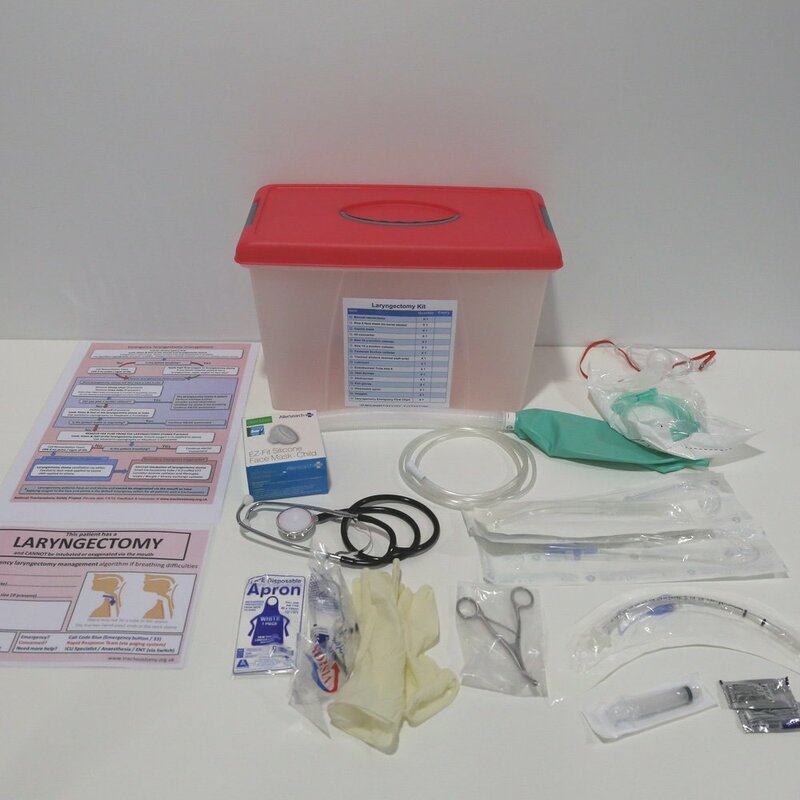 A box of emergency equipment should be kept by the bed of every patient with a tracheostomy, so that everything is easily to hand if the patient develops breathing difficulties. -Know your tracheostomy tubes. Know that one size does not fit all and that your patient might need a non-standard tube. 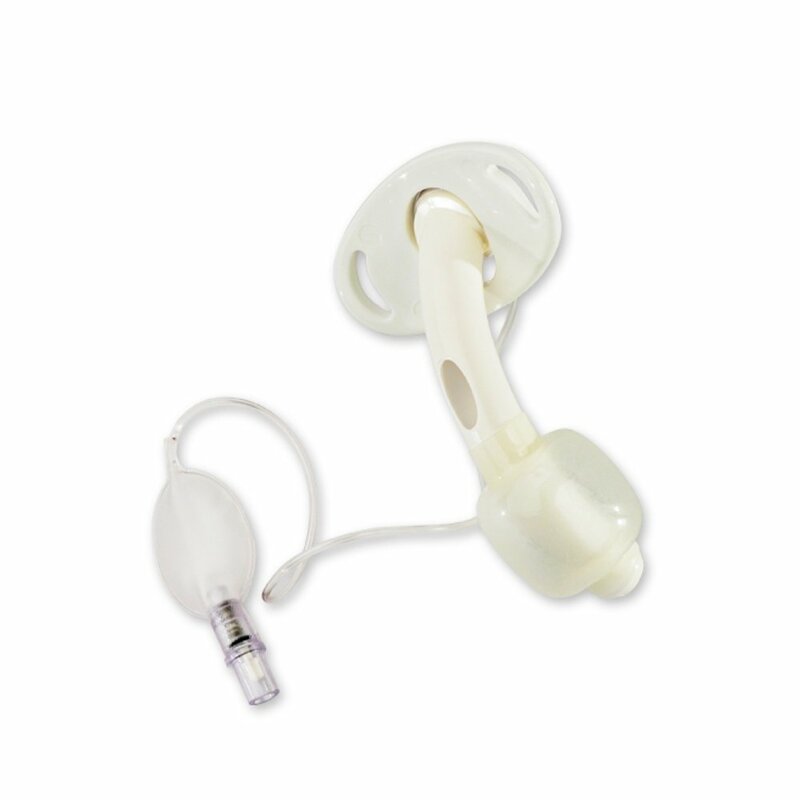 -Patients with a tracheostomy require close supervision and monitoring. Critical incidents are all too common and can be rapidly life-threatening. -If asked to perform an elective tracheostomy tube change, make sure you have the right equipment, skills and supervision. If you don’t have advanced airway skills, you will need to be supervised by somebody who does. -When changing a tracheostomy tube, use an introducer, especially if the stoma is not well established. Inserting the tube at 90 degrees to the trachea can make the initial passage easier. -Use bed head signs for your patients with tracheostomy and laryngectomy to help you and your colleagues in an emergency. -Know your emergency algorithms. 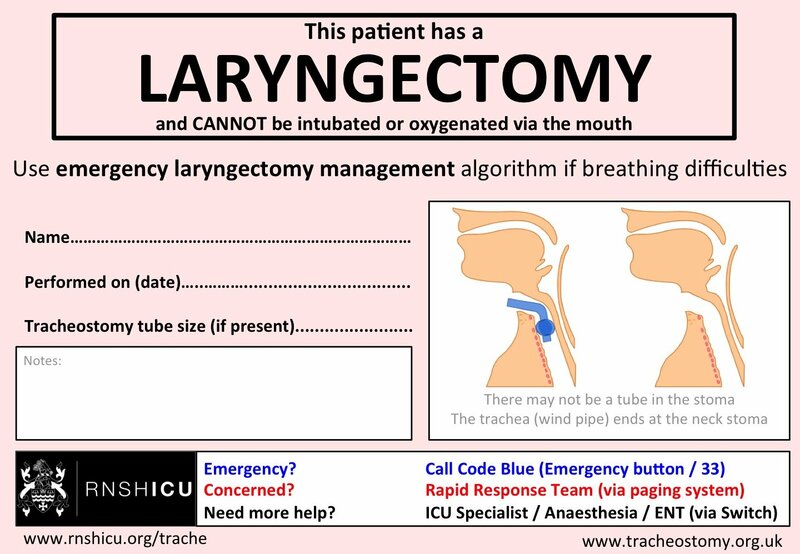 Be prepared to remove a tracheostomy or laryngectomy tube if your assessments suggest it is blocked or displaced, and the patient is deteriorating. 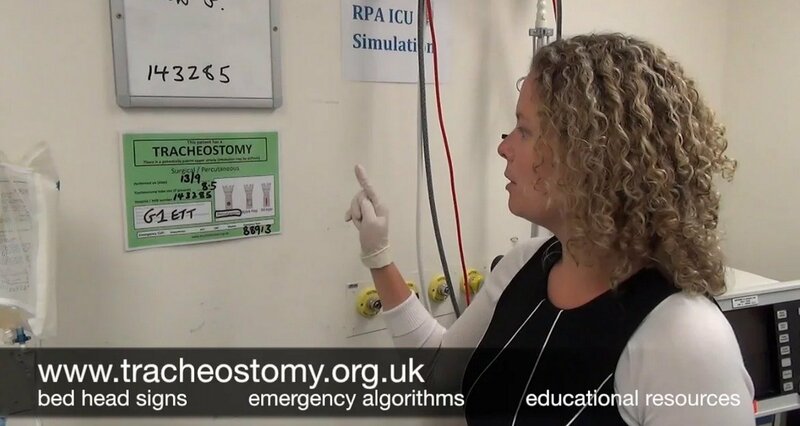 -If you remove a tracheostomy tube, cover the stoma and remember your basic airway management skills: positioning, two-person technique, airway manoeuvres and adjuncts. 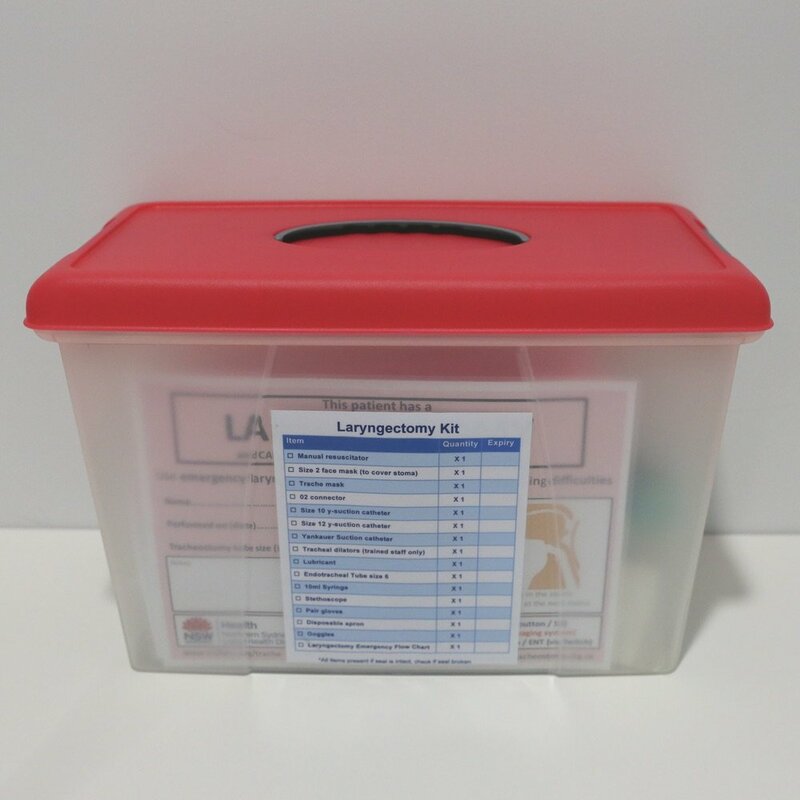 -If you remove a laryngectomy tube, you can ventilate through the stoma with a paediatric face mask or LMA, while you gather the equipment and personnel to replace the laryngectomy tube if required. 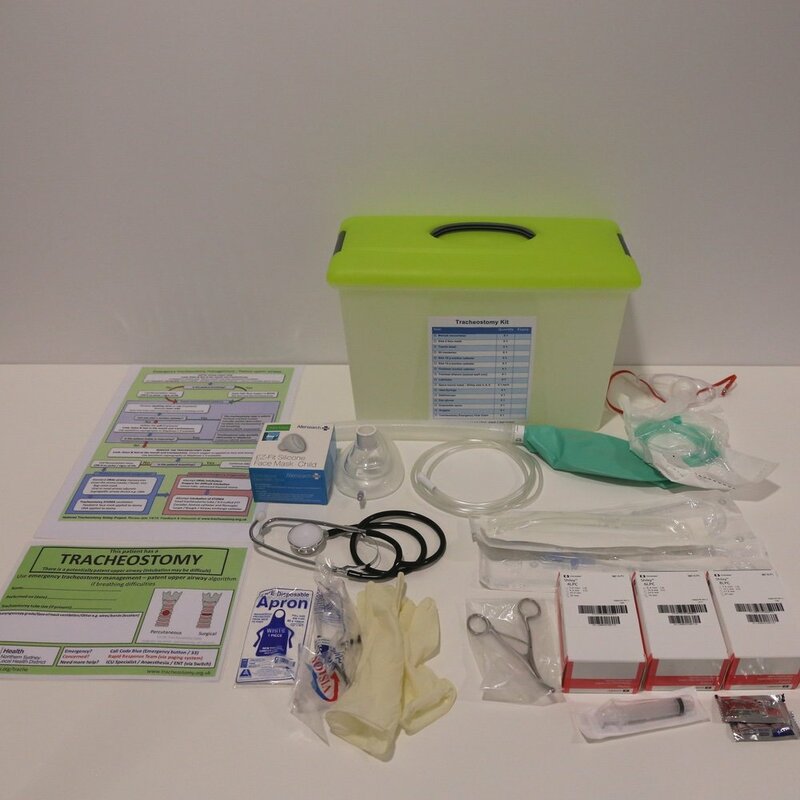 -Ensure the right equipment is by the bedside of all tracheostomy and laryngectomy patients, and that you take an emergency kit with you when accompanying these patients on transfers. -Know who is in your hospital Tracheostomy Team. If your hospital doesn’t have one, and you have the right skills, set one up! Durbin CG, Jr. Tracheostomy: why, when, and how? Respiratory care. 2010;55(8):1056-1068. Delaney A, Bagshaw SM, Nalos M. Percutaneous dilatational tracheostomy versus surgical tracheostomy in critically ill patients: a systematic review and meta-analysis. Critical care. 2006;10(2):R55. 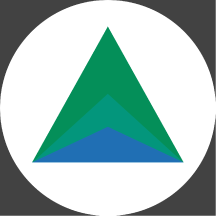 Agency for Clinical Innovation. Care of Adult Patients in Acute Care Facilities with a Tracheostomy, Clinical Practice Guideline, 2013. Available: http://www.aci.health.nsw.gov.au/__data/assets/pdf_file/0005/181454/ACI_Tracheostomy_CPG.pdf. Hess DR. Tracheostomy tubes and related appliances. Respiratory care. 2005;50(4):497-510. Mallick A, Bodenham A, Elliot S, Oram J. An investigation into the length of standard tracheostomy tubes in critical care patients. Anaesthesia. 2008;63(3):302-306. White AC, Kher S, O’Connor HH. When to change a tracheostomy tube. Respiratory care. 2010;55(8):1069-1075. 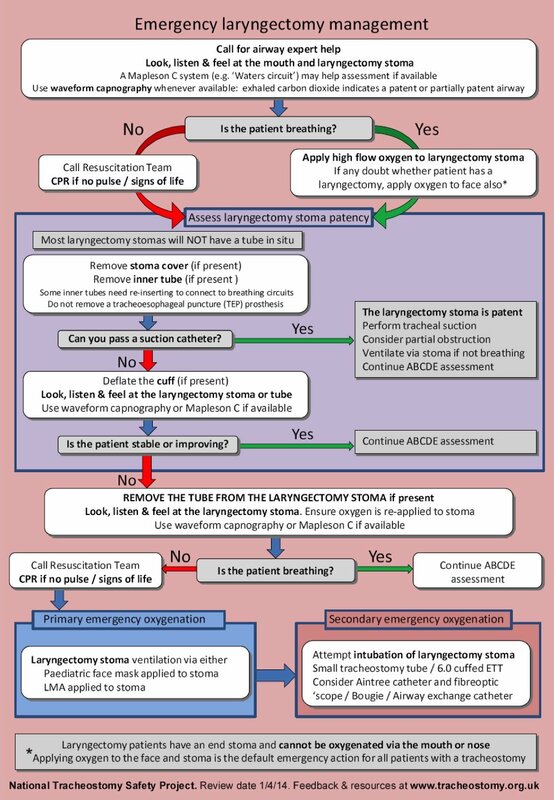 McGrath BA, Bates L, Atkinson D, Moore JA, National Tracheostomy Safety P. Multidisciplinary guidelines for the management of tracheostomy and laryngectomy airway emergencies. Anaesthesia. 2012;67(9):1025-1041. Thomas AN, McGrath BA. Patient safety incidents associated with airway devices in critical care: a review of reports to the UK National Patient Safety Agency. Anaesthesia. 2009;64(4):358-365. Safety Notice 018/09 – NSW Health. 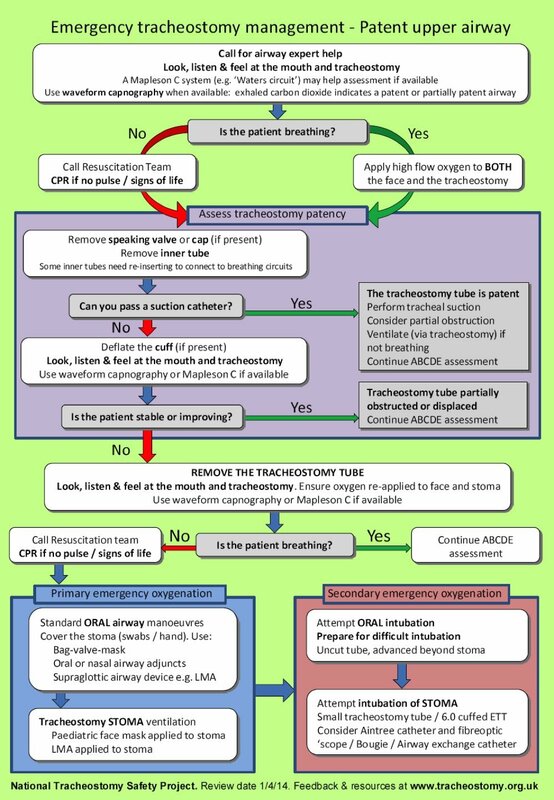 Reducing Incidents Involving Tracheostomy Tube Care, 2009. Available: http://www.health.nsw.gov.au/sabs/Documents/2009-sn-018.pdf. Cameron TS, McKinstry A, Burt SK, et al. Outcomes of patients with spinal cord injury before and after introduction of an interdisciplinary tracheostomy team. Critical care and resuscitation : journal of the Australasian Academy of Critical Care Medicine. 2009;11(1):14-19. Tobin AE, Santamaria JD. An intensivist-led tracheostomy review team is associated with shorter decannulation time and length of stay: a prospective cohort study. Critical care. 2008;12(2):R48. LeBlanc J, Shultz JR, Seresova A, et al. Outcome in tracheostomized patients with severe traumatic brain injury following implementation of a specialized multidisciplinary tracheostomy team. The Journal of head trauma rehabilitation. 2010;25(5):362-365.